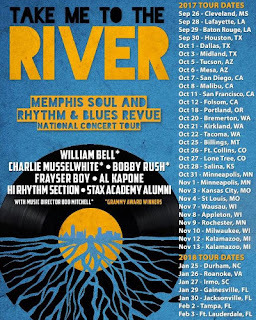 Home / -Touring- / Bobby Rush / Charlie Musselwhite / Hi Rhythm Section / Touring / William Bell / William Bell, Bobby Rush, Charlie Musselwhite to Tour "Take Me to the River: Memphis Soul and Rhythm & Blues Revue"
William Bell, Bobby Rush, Charlie Musselwhite to Tour "Take Me to the River: Memphis Soul and Rhythm & Blues Revue"
In 2014, the documentary Take Me to the River was released featuring the recording of an album that brought together veteran Memphis R&B artists to mentor younger musicians. The film starred Snoop Dogg, Mavis Staple, Booker T. Jones, Charlie Musselwhite, William Bell, Bobby "Blue" Bland, Bobby Rush and many others both old and new. 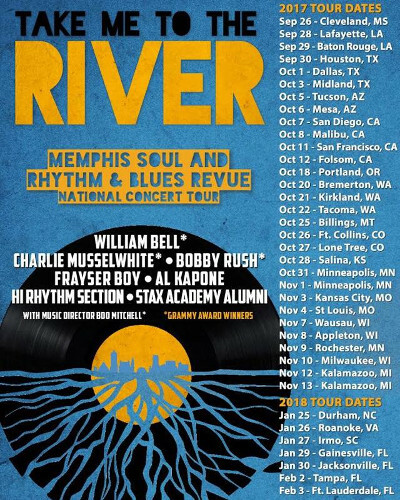 Along with over thirty shows, the tour also has an education initiative to reach thousand of students and teach them about soul and R&B music. The program is a co-partnership with the Berklee City Music Network.